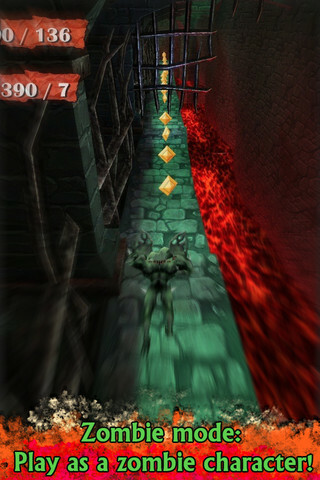 Burned out on Temple Run and Agent Dash, but still jonesing for some more running fun? Check out the gothic creepiness that isZombie Chasing, a running game for iPhone in the style of the hugely-popular Temple Run, developed by MagicBone Ltd. Instead of playing as a jungle explorer type of person, Zombie Chasing has you play as a man being chased by the demonic undead. There’s also a zombie mode where the runner you control is a zombie character. There are six characters in all to look forward to, as well as multiple “chapters” to run through. 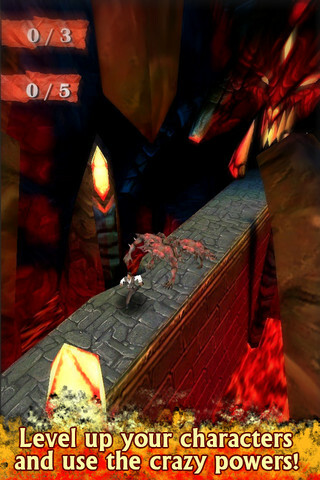 The environment in this iPhone game is like a dungeon from your worst nightmare, and it’s a ton of fun to run through. The tilt controls are a little hyper-sensitive, and the lighting makes it hard to see the turns you need to take until you’re practically on top of them. But despite those minor annoyances, running through this nightmarish landscape is pulse-pounding fun. Also pulse-pounding? The amazingly atmospheric soundtrack. It’s wonderfully spooky, and gets your adrenaline pumping as much during your digital run as it would during a real-world jog. Another feature that’s unique to Zombie Chasing is the respawn system. If you crash into a wall or fall into a chasm, you die. 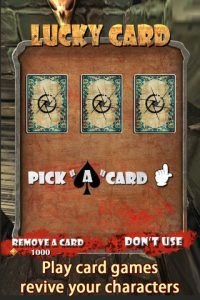 That is, unless, you can pick the “lucky card” during the digital game of 3 Card Monte that takes place after each run. If you pick the right card, then you are able to get revived. 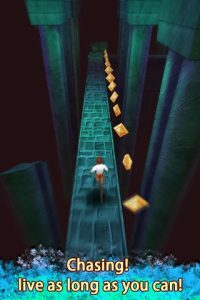 With great Game Center support, chillingly awesome graphics, and solid gameplay mechanics, it’s not hard to see why fans of Temple Run or Agent Dash would enjoy Zombie Chasing. If you’ve leveled up in every other running game on your iPhone, try out this darkly fantastic take on the genre. 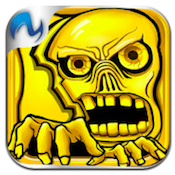 Zombie Chasingis compatible with iPhone, iPod touch, and iPad. Requires iOS 4.0 or later. A small expedite fee was paid by the developer to speed up the publication of this iPhone game review.